UNIVERSITY PARK — Penn State’s football clash with in-state rival Pitt this fall will be played under the lights. The first game time of the 2018 Penn State football season finds the Nittany Lions visiting Pittsburgh at Heinz Field for an ABC Saturday Night Football game on Sept. 8. The Keystone Classic presented by Peoples Natural Gas will kick at 8 p.m. The Nittany Lions face Pitt for the third game of the four-game series. Penn State is 51-43-4 all-time against the Panthers. 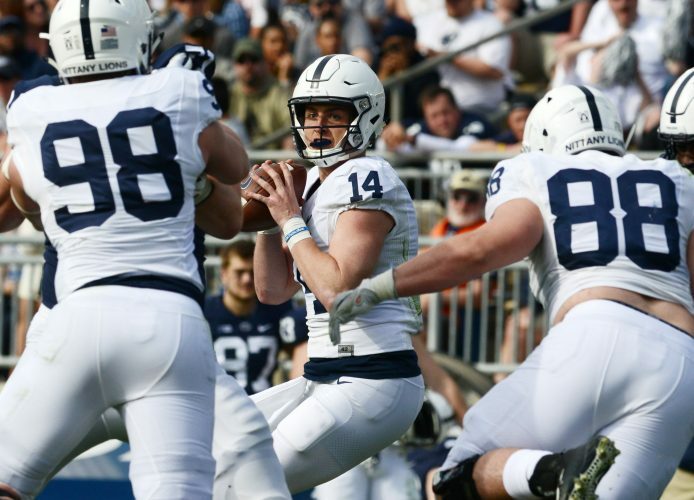 Last season, the Nittany Lions used a pair of Mike Gesicki touchdown catches and two scores by Saquon Barkley to post a 33-14 win over Pittsburgh. ROSEMONT, Ill. — The Penn State men’s basketball team returns to the Gavitt Tipoff Games schedule and will play DePaul on Nov. 15 at Wintrust Arena in Chicago. The Big Ten and Big East conference offices jointly announced the game dates and opponents Tuesday. The series was named to honor the late Dave Gavitt, the founder of the Big East Conference and basketball visionary.